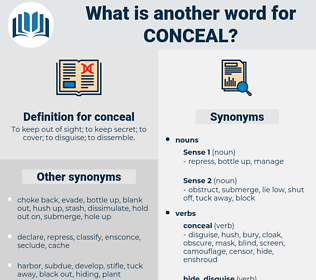 What is another word for conceal? To keep out of sight; to keep secret; to cover; to disguise; to dissemble. put out of the way. 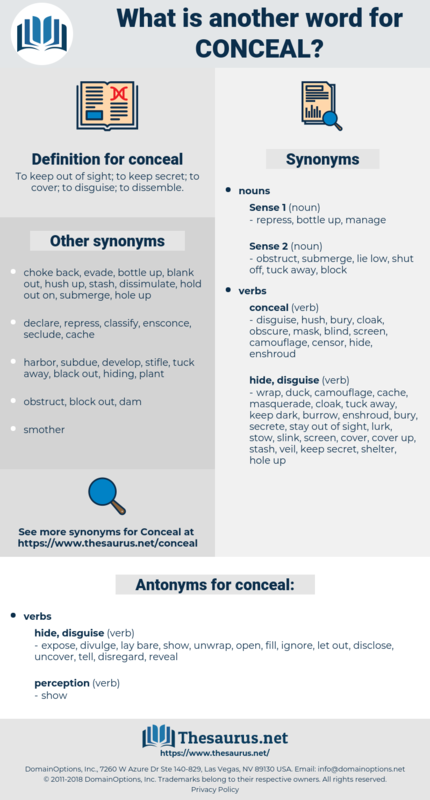 hidden, hide, Hid, hides, mask, obscure, camouflage, cover, cloak, overshadow, withhold, deny, bury, whitewash, ignore, shield, reveal, suppress, stash, overlook, sweep, negate. expose, divulge, lay bare, show, unwrap, open, fill, ignore, let out, disclose, uncover, tell, disregard, reveal. exhibit, air, admit, spread, betray, disinter, display, exhume, avow, illuminate, parade, raise, lay open, bare, discover, present, make known, bring out, unearth, clarify, manifest, promulgate. I faltered out, unable to conceal my real reasons entirely. There was no corner in the passage to conceal him; there was no other door behind which he could slip. cover, bury, harbour, haze over, mask, obstruct, befog, obscure, skulk, shield, secrete, lurk, cover up, harbor, cloud, becloud, occult, sweep under the rug, disguise, block, mist, fog, Obnubilate, bosom, veil.